"This is the first visit of the King of Saudi Arabia to Russia in the history of our relations, which in itself is a very significant event. Our relations have a fairly lengthy history," Putin said at a meeting with the King, adding that he hopes that the visit will contribute to the development of bilateral ties. In his turn, the Saudi monarch said Riyadh seeks to strengthen its relations with Moscow for the sake of peace and security, as well as the development of an international economy. “We are happy to be in a friendly country. We seek to strengthen bilateral relations for the sake of peace and security, for the sake of the development of the global economy,” the King said during a meeting with Russian President Vladimir Putin. Speaking to reporters about the meeting between the two leaders, Kremlin spokesman Dmitry Peskov said that the potential for bilateral cooperation is "rather broad," adding that Moscow and Riyadh have shown the political will to deepen cooperation and interaction on a wide range of issues. The Saudi King arrived in Russia on Wednesday; the Russia-Saudi investment forum is timed to coincide with the visit. The Saudi Foreign Minister has said that a number of "important documents are expected to be signed." The Russian Industry and Trade Ministry has said Riyadh is planning to invest in more than 25 agriculture, oil and gas projects in Russia. Also, firms from the two nations are planning to create a new investment platform in the energy sector during the visit. 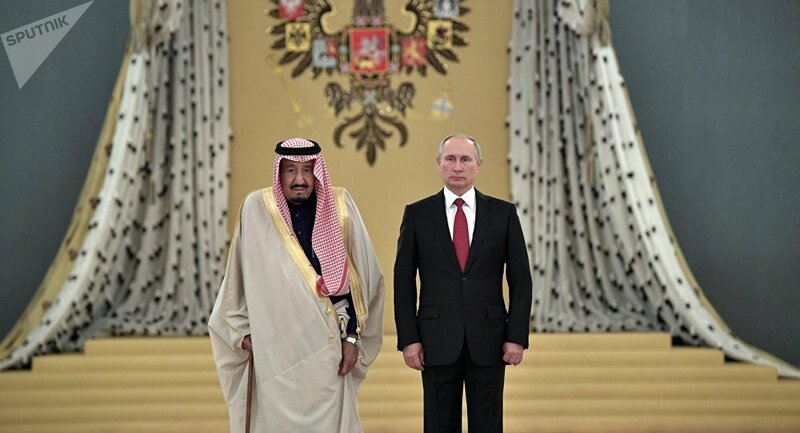 Saudi King Salman bin Abdulaziz Al Saud invited on Thursday Russian President Vladimir Putin to visit the country, with the latter accepting the invitation. “I am pleased to send an invitation to visit the Kingdom of Saudi Arabia,” the king said during talks with the Russian president. Putin, in turn, thanked him for the invitation. “I remember my previous visit to your country. And I will definitely act upon your invitation to visit Saudi Arabia again,” Putin said. The two leaders have talked on the situation in the Middle East. Putin said that his talks were detailed, with the sides discussing the situation in the region. "Just now, we held very detailed talks in a narrow format. We discussed bilateral relations and the situation in the region. This discussion was very substantive, informative and very trusting," Putin said. The Saudi King has specifically touched upon the Syrian issue, saying Riyadh intends to achieve the resolution of the crisis in the war-ravaged country in accordance with Geneva decisions and UN Security Council resolutions. "As far as the Syrian crisis is concerned, we seek its termination in accordance with Geneva-1 decisions and a UN Security Council resolution," the king said at talks with Russian President Vladimir Putin. Saudi Arabia seeks to continue cooperation with Russia to achieve stability on global oil markets, King Salman said during the meeting with President Putin. "We are striving to continue positive cooperation between our countries to achieve stability on the global oil markets, which contributes to the growth of the world economy," the king said. Saudi King Salman bin Abdulaziz Al Saud has said the views of Moscow and Riyadh on many regional and international problems coincide. He noted the Russian side's friendly attitude and reaffirmed the mutual desire to strengthen relations between Russia and Saudi Arabia in various spheres. "We note that these relations are characterized by the coincidence of views on many regional and international problems," the king said.